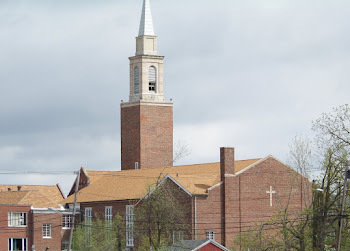 In previous Memorial Day weekend Sundays, St. Patrick's became somewhat of a ghost town, so I think the high gas prices kept most of us in town and I am glad we all used that opportunity to praise God together. Corpus Christi is a day set aside to pay special attention to the Eucharist. Communion, the Eucharist (thanksgiving) , Mass (Latin for table), the Lord's Supper, Lord's Table--all names for the same celebration--is supposed to be the unity of the Church but often is what divides. This Wikipedia article does a pretty good job of describing all the different views the Church has on this subject. It is worth the read. I do believe and take it. Yesterday I left my normal emphasis on spiritual formation and life-application sermons to simply try and teach the plain sense of the readings from Deut. 8, John 6, and 1 Cor. 10 to address Corpus Christi on a purely biblical level. I dealt with manna and the sustaining of temporal life by God in the wilderness, how Jesus is the true Manna come down from heaven to give eternal life, and Paul's appeal to a divided Corinthian Church about being united using the pictures of being God's bread and body for the life of the world. Everyone should visit the Amherst Community Church bookstore when you get a chance for some neat items for sale there! Also, pop in early sometime and worship with ACC! Lastly, Pastor Thomas has asked us to avoid parking in the gated section of the lot closest to Main St. as he would like to lock that up when he leaves while we are still in worship. Please pray this week for Amanda whose boyfriend Dylan passed away last week at the age of 32. Pray for Sharon Pittman to be cancer free. Pray for te upcoming CEC International Convocation in Orlando. Pray for Fr. Kevin's business trip to Phoenix the second week of June to go well. Pray for the businesses and organizations where our church family are employed to be blessed by God during this economic contraction. Pray for God to be glorified through our church and for Jesus to build his Church in our midst. Monday morning reflection on the previous day's worship at St. Patrick's... Trinity Sunday 2008 led me to think about the readings for the day in light of creation and new creation. The long account of how God created the world in Genesis gives way to the Great Commission in Matthew 28 where God's plan to re-create the world is revealed. My homily focused on how God made everything in the world--from people, to animals, to plants-- with seed within it in order for his creation to be fruitful, multiply, and fill the earth. That is what the Great Commission is all about. Within every Christian is the Seed of the woman and Seed of Abraham--Jesus Christ--and God is planting us in the world to share Jesus with others. The thrust of the message was once again on evangelism. The downside to yesterday was it was a cold wet day and attendance was down. In a smaller mission church, each week we have to try and have critical mass. Critical mass is a sociodynamic term to describe the existence of sufficient momentum in a social system such that the momentum becomes self-sustaining and fuels further growth. If we do not have enough people in church on Sunday, the service lacks the energy and momentum to fuel growth. Community: Those living around our church who never, or occasionally, attend. Crowd: Those who attend our church regularly but are not members. Congregation: Those who are committed to both Christ and membership in our church family. Committed: Those members who are serious about growing to spiritual maturity. Core: Those members who actively serve in ministry and mission in your church. Each group has unique needs, motives, challenges, and POTENTIAL! Our goal is to turn an audience into a work force for God. Which circle are you in at St. Patrick's? Churches gain momentum when the committed and the core circles increase. The minimum commitment needed for a mission church to grow is CROWD. I invite you to make a deeper commitment to God as we all work together to sustain the critical mass that fuels the growth of our church!